The province of Oaxaca is one of the least developed regions in Mexico. This means that when you visits smaller towns in the area you might be looked upon with suspicion. The upside for you as a traveler is that lodging and dining in Oaxaca are remarkably affordable. The hotels in Oaxaca really take you back to colonial times. The hotels in Oaxaca can easily compete in quality, installation, and services with the best tourist centers in Mexico. 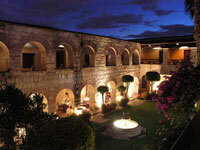 In Oaxaca the hotels are beautiful resembling old colonial houses of great architecture and artistic importance. Even some 16th century convent have been converted into a luxurious hotel. Oaxaca City also has 5 star hotels as well as moderately priced lodgings. Below is a list of types of hotels and resorts in the Oaxaca area of Oaxaca, Mexico. Click on the listings below to view hotels in Oaxaca.